Be prepared to be amazed by ‘jaw-dropping’ young talent! August 2018 marks the Centennial Anniversary of Leonard Bernstein. Leonard Bernstein was an American composer, conductor, author, music lecturer, and pianist. He was among the first conductors born and educated in the US to receive worldwide acclaim. According to music critic Donal Henahan, he was “one of the most prodigiously talented and successful musicians in American history.” His fame derived from his long tenure as the music director of the New York Philharmonic, from his conducting concerts with most of the world’s leading orchestras, and from his music for West Side Story, Peter Pan, Candide, Wonderful Town, On the Town, On the Waterfront, his Mass, and a range of other compositions, including three symphonies and many shorter chamber and solo works. Bernstein was the first conductor to give a series of television lectures on classical music, starting in 1954 and continuing until his death. He was a skilled pianist, often conducting piano concertos from the keyboard. As a composer he wrote in many styles encompassing symphonic and orchestral music, ballet, film and theatre music, choral works, opera, chamber music and pieces for the piano. The Plano Symphony welcomes Chamberlain Performing Arts for Bernstein’s West Side Story dances. 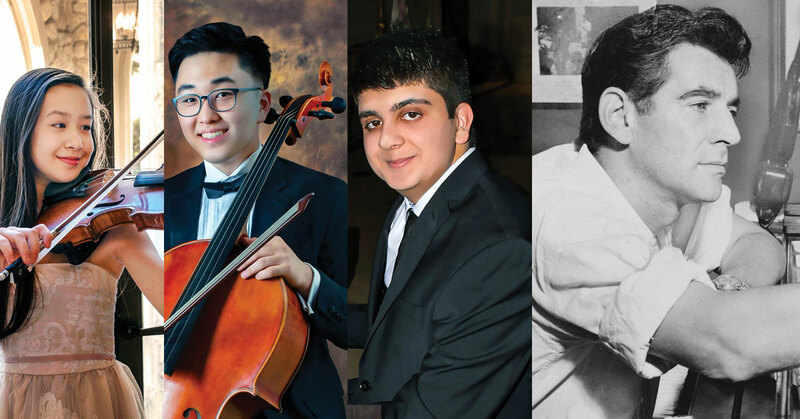 Then be prepared to be amazed by the incredible winners of the annual Collin County Young Artist Competition in their concerto-winning performances – an amazing showcase of extraordinary young talent.